The BV107 is a serial to WiFi (and visa-versa) converter. Similar to USB to Serial but WiFi instead of the USB. This means that any serial device can be controlled at a distance. NOTE: This the firmware installed on the ESP8266 was inspired by the work done here. In most circumstances the device will need to be set up as a station, similar to the WiFi on a laptop or tablet. There is also a quick start guide available in pdf. There is more information on setting up using a serial connection later in the text. Make sure this address is not the same as any other address on the network. The device is now ready for use, see the various modes for how to use it below. This is a typical set up for developing with and using a wired serial connection. Arrangement when used as a station, the bridge replaces the USB to serial device. Arrangement when used as an access point, the bridge replaces the USB to serial device. The bridge is an almost direct replacement for the USB to Serial device, thus freeing the endpoint from wires. When using this arrangement instead of using a normal coms program such as mini term etc. the program also needs to be able to establish a TCP connection. Hyperterminal and putty will do this but a much easier option is to use BVSerial which can be set to connect to a specific socket (more later on sockets). There are two possible options with this arrangement. The first and probably most common is to set the bridge so that it connects with an existing wi-fi access point (AP). To do this the SSID and password is needed for that AP and is set in the bridge (BV107). The advantage of this is that the bridge can be accessed anywhere the AP can reach and also any other device on the network also has access to the BV107. An alternative is to set the bridge itself to be an access point, of course the client (the pc or smartphone) will need to connect to the bridge using the SSID of the bridge. There are at least three kinds of hardware that all work in exactly the same way, the difference is the features or number of pins. The break out board is used as an example as this has the most features. BV107-A The board is supplied as a kit but with options. In minimal form it is as above with all of the SMD components mounted, pins and socket. The user can use either a Plug type or an SMD type module. The BV107 has an on board 3.3V regulator and a reservoir capacitor for transmission burst. All of the outputs are connected to pads for general purpose use. The pins are spaced so that it can plug into a breadboard. Serial: This is intended to be the main I/O for the device and would normally be connected to the equipment where the replacement serial interface would go. There is a GPIO4 output (that is only available on the SMD type ESP8266) which can be made to toggle low by sending a command from the TCP end. This is useful if a microcontroller is connected and it needs to be reset remotely. 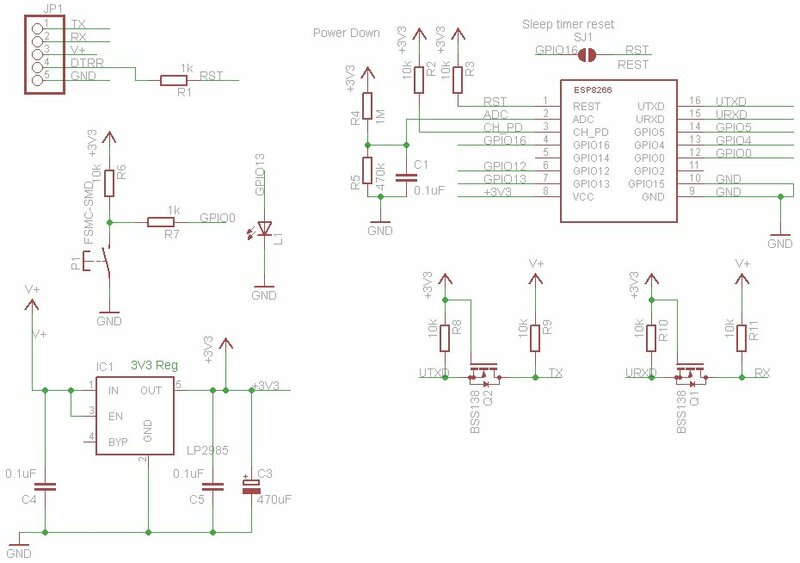 I2C: This is connected to GPIO2 and GPIO14 (GPIO14 is only available on the SMD type ESP8266). suitable firmware is included in version 2c for the ESP8266 to operate this. Programming: This is similar to the serial I/O in that UTXD=TX and URXD=RX however if DTR and RTS are connected to the designated pins a Python program can be used to program the ESP8266. Power: The +V pin appears in three places and it is the input to the voltage regulator. This is rated as a maximum input of 6V and 300mA so a battery supply can be used. On this version of the board a resistor is needed for the CH_PD line. It has been left out as some applications need to control this line without a resistor in place. Future version will have a resistor as part of the PCB that can be removed if required. Under normal circumstances the CH_PD line needs to be high (3.3V) for correct operation. The resistor is provided but it must be installed by the user. Position for when PHT type ESP8266 is used and for when SMD type is used. ** Versions with F1_1.9.15+ firmware can send and receive data directly from a browser. The device can be controlled from a browser in two ways, using the HTTP GET (or POST) and through web sockets. This is a very simple example of how to send and receive using a web browser and a small amount of Java script. Some points to consider when using this method. A web socket is a more permanent connection with the device, once connected data can eb sent back and forth until disconnected. The source is a bit more complicated but it does give the opportunity of a two way communications and the other end can initiate the conversation. Because there is less set up (HTTP requires a connection each time) the communication can be a bit faster. This will send text to a VT100 serial display such as the BV4618. Connect the USB to serial as shown, note TX goes to RX and RX goes to TX. It is also useful to connect the DTR line which is on the programming connector but that is not essential. At switch on you should see something like this. If the DTR line is connected then pressing the reset icon (next to the exit icon) will reset the ESP8266 and show TBREADY: again. If not then it must be fixed before proceeding any further. The command set is now available, using the commands will enable any setup condition to be realised. Note that the same IP is used as was set in Step 4. A black window should open, anything typed on the back screen will appear on the serial BV_COM screen and vice-verse. Now type something on BV_COM2 and that will appear on BVSerial. NOTE that there is no echo on BV_COM2 by default. See the details link on this page for the commands, including the I2C commands. NOTE: There is an error on revision 0 (current revision) PCB in that the 3v3 pad is not connected to anything. It will need a wire soldering from that pad to a 3v3 connected pad. The firmware that is used on the ESP8266 to create a transparent bridge is open source. The zip file includes all of the source code. The firmware is in the firmware directory and has 2 binary files. Full details of how to upload new firmware is given in this link. You will need a USB to serial device. The firmware is based on the work done by beckdac and the original can be found at the link. I have modified the commands mainly so that they work at the terminal and the TCP end. Also added I2C (with clock stretching). If you just need to update the firmware then use this link, if you are more ambitious then follow the steps below. The latest firmware can be found in the ESP upgrade link given previously. The zip file contains the firmware and a python program that can download in 2 parts to the ESP8266. It does not work every time so perseverance is required. Unzip the file into a directory, open a command window (start type cmd). Make sure you are in the same directory as the python file 'esptool.py' and type flash com10 (or whatever your com port is). You can see in the above screen shot it did not work the first time. Success is designated by two successful flash downloads, this takes about 30 seconds.